On October 4th – I gave birth to my perfect little Leon (LL) weighing 3.42 kilos (7.5 pounds) and measuring 49cm’s. The birth was 100% drug free and I was able to leave the hospital after 4 hours because I had no tears/damage what so ever and my partner, bub and myself were doing great. My partner Draze and I are certain had we not completed Hypnobirthing Australia classes (HB), the event would have easily been far more stressful for us both. What is Hypnobirth you ask? I first came across HB after hearing another mum on Facebook talk about her amazing experience of pregnancy and birth using HB methods. Being about 20 weeks pregnant at the time, I had a huge amount of anxiety and fear surrounding birth mostly due to the fact all around me people were sharing horror stories. Deep down I knew birth was a natural thing and something must be going wrong for it to be this traumatic to many mums. I asked around and Pip Wynn Owen from Hypnobirthing Australia™ was highly recommended. This course has an incredible amount of information on HB and birth education. At first I was a little hesitant on the course price but let me tell you it was absolutely the best money I’ve spend so far as an investment for both me and my little Leon (LL). For those who have never heard of HB, it’s basically a range of techniques which you can use during pregnancy and birth to allow your body to do what it is designed to do, and also allowing us to accept and cope with any obstacles (which I sure had!) along the way. Cutting it short, if we enter labour with a huge fear about birth our body go’s into ‘fight or flight’ mode, directing all our blood to our limbs instead of to the uterus where it’s needed most. This fear also causes pain to physically feel more painful! So HB looks at completely eliminating fear from the start. I started the Hypnobirthing Australia™ classes around 23 weeks pregnant. After 12 hours’ worth of classes, and weeks of practicing positive affirmations and listening to the positive meditation tracks, by the end of my pregnancy I successfully convinced myself birth is as natural as us breathing and if my body can convert 1 single cell into a baby it is more than capable of birthing it. What I found most reassuring was my class had 3 pregnant midwives attending who had all witnessed women who had hypnobirth in Hospitals and wanted to experience these calm births for themselves. On October 4th (birth date) I was 8 days past due date and was booked in at the hospital to have a scan to check LL was doing okay in there. He was all fine with plenty of fluid surrounding him. Three days before this I was starting to have a lot of Braxton hicks practice contraction’s which were very persistent but would then stop for an hour at times and when I went to bed. The hospital suggested a ‘stretch and sweep’ and though I wasn’t keen on having much interference, I felt like this was a good idea to encourage things to move along and avoid an induction. 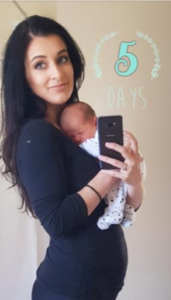 I was feeling quite exhausted from over 48 hours of Braxton hicks which would wake me up throughout the night, so the stretch and sweep was done around 4pm, the midwife said I was half a centimetre dilated at the time. On the way home my contractions instantly intensified and became more and more regular. By 6pm they were 5 minutes apart and becoming way more intense. Draze was doing an amazing job at supporting me through these. He came along to the HB classes and leading up to due date we had our cheat sheets ready and discussed the tools we could both use. During contractions he could see I was quite tense and he would constantly remind me to relax my shoulders and body and breathe deep. Another great tool was using trigger points particularly the ones on my lower back, he would push these points which instantly either stopped or reduced the contraction intensity. Draze also ran the bath nice and warm and played my HB positive affirmation track which was on my phone. This worked amazingly!! The warmth of the water stopped the pain radiating down my legs and back. I gave birth at 9pm which means I went from 2cm to 10cm dilated in under 4 hours! I think this is why my contractions were very intense, but the time in between contractions I really focused on relaxing, staying positive and constantly telling myself affirmations we learnt in class. 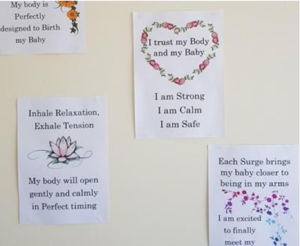 Some of these affirmations included; ‘my body is perfectly designed to birth my baby’, ‘I am calm, I am strong, I am safe’, ‘I am excited to have my little baby in my arms’. I also had these printed out on my bedroom wall. At around 7pm, we rang the hospital to say my contractions were 4 minutes apart, they then told us they were at capacity, with no midwives available and we had to go to another hospital. When I first heard this I was a little stressed as I was quite set on having a water birth which was available at Fiona Stanley my original hospital, especially after experiencing the relief of my warm bath at home. About half an hour passed by with Draze taking a few phone calls from the hospital who confirmed I’d have to go to Armadale hospital which is half an hours’ drive away, at this stage my contractions were every 2- 3 minutes. We jumped in the car and sped! Note: Armadale do have a water birth bath but at the time I went in they told me there was no water birth qualified Midwife on duty. My contractions during the car trip were still very intense and I was having to lift myself off the seat as I could feel his head bearing down. I was 99% sure I’d be giving birth in the car but refrained from taking my knickers off until the absolute last minute so to not stress out Draze. He, likewise was quite stressed but stayed calm for my sake and kept repeating affirmations and that ‘we are going to make it!’ We arrived at the hospital at 8.15pm and like a movie seen everyone cleared my path knowing I was about to POP! We made it to the maternity ward and the Midwives were very welcoming, they were pointing me in the direction of the assessment room but I replied ‘He’s coming right now!’ haha, I remember the look on the Midwifes face as she paused and realised I really meant it. So we went straight to the birthing room and within 30 seconds my bag, shoes and undies came off and I was climbing onto the bed. I knew I didn’t want to give birth on my back (because gravity!) and Pip specifically talked about the birth canal and how back births really aren’t ideal for both you and the baby. So after the Midwife checked my dilation which was 9 cm I turned around onto all fours with my arms up on the bed headrest. I remember the Midwife asking me a few times if I would like some Gas but I happily said no. Yes the contractions were intense but between contractions was complete relief and I was able to keep myself together. During contractions I could feel a greater sense of him moving into the birth canal and an uncontrollable urge to push with the contractions. In between contractions the baby’s head moved back up a little. Pip also mentioned this happening and that baby would move ‘2 steps forward (lower down)’ then ‘one step back (retracting back up)’. She said this was very important as it allows the perineum to stretch properly reducing the chance of tears. If you have a midwife telling you to push push push! The area stretches too quickly resulting in damage. I just listened to my body and was patient with the process. Little Leon was born at 9:03pm in his Amniotic Sac, if you Google En Caul birth you’ll see exactly what that is, unfortunately we didn’t get out own photos as Draze was too busy being an amazing support person to me. The Midwives couldn’t thank me enough for letting them experience this type of birth and kept saying I did such a great job throughout the whole thing. I was also happy to have delayed cord clamping, natural placenta delivery and 2 hours chest to chest where we initiated breastfeeding before Leon was weighed and measured. 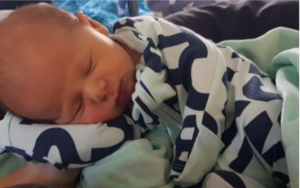 I can’t thank the Hypnobirthing Australia™ classes, Pip’s amazing knowledge, my partner and the incredible Midwives at Armadale hospital enough. I’m delighted to share this story as I think it’s important for expectant mothers to realised it IS possible to have a great birth. Keep positive, get educated and trust your body!